When I think about this recipe for fungee, codfish and chop up, I can only think about my mother. This is my favorite dish from our native Antigua in the Caribbean, and I have recently started to learn how to make it. When I was younger, I didn’t appreciate the stories she would tell me about cooking in the village where she grew up, but I do understand now how important it was to have neighbors who made sure that you knew you’re rice wasn’t burning. With small, simple homes and a close-knit community, cooking was always at the forefront of community gatherings in my mother’s village. Cooking wasn’t just something that you did for yourself, but it was also a means of bringing together households. 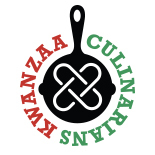 I believe that cooking can be a collective activity that benefits the community in the spirit of the Kwanzaa principle of Ujima. Since the homes in my mother’s village were so close together, people would often share cooking responsibilities. If you cooked the fish, your neighbor would cook the rice. Another would cook the vegetables. It was all about sharing and allowing each household to help their neighbor. I sometimes wonder if we forget the power of cooking to bring us together. We live in such a fast-paced world where many of us don’t have the time to cook as much as we’d like. If we all took the time to cook for each other as a form of communally participating in an important daily task, it might help strengthen community bonds, allow for better nutrition and provide a means of helping each other carry some of the burdens of everyday life. Perhaps cooking wouldn’t seem like such a chore to so many, if they knew that their neighbor down the street was there to help out. I hope in the upcoming year that we’ll all see the preparation of food as not only a way of entertaining and enjoying each other’s company but also as a way to support each other. 1. Fill a medium sized pot half full of water and add the soaked fish. Bring to a boil and make sure that the fish is fully cooked. 2. Drain fish in a colander. Using a knife, carefully de-bone the fish as much as possible. Use a spoon or hands to break the fish into pieces. 3. In a large skillet, add a tablespoon of the oil. Add the onion and cook until softened, add two tablespoons of tomato paste and the cod. Mix the onions, tomato paste and cod until the cod is completely coated. Keep warm. Note: Chop Up signifies chopped sautéed vegetables. Often it consists of eggplant, spinach, squash or other vegetables. This recipe includes spinach and eggplant. 1. Boil until spinach is cooked through. Season to taste, if desired. Reserve. 2. Heat a tablespoon of oil in a medium skillet or saucepan. Add the onion, and cook until softened. 3. Add the cubed eggplant. Season the eggplant with ½ teaspoon of the seasoned salt. 4. Let the eggplant cook while stirring from time to time. The eggplant will soften and become slightly mushy. Season to taste, if desired. 5. In another large skillet, add 2 tbs. of oil to the edges and the bottom of the skillet. Add the Sauteed Codfish (see recipe above), reserved spinach, and eggplant to the skillet separated into distinct sections in the skillet. Keep warm on low heat until ready to be served with the Fungee (see recipe below). 1. Empty package of cornmeal into a medium sized bowl. Add water and stir the cornmeal until it is smooth making sure that no lumps remain. 2. Bring salted water to a boil in medium pot, and add the frozen okra. Allow to cook through. Remove okra with a slotted spoon and pour the majority of water into a large bowl leaving about 1 cup in the pot. Put aside the okra in a large bowl leaving the remaining water in the pot. 3. Add the cornmeal to reserved water in the pot. Vigorously mix the cornmeal continuously with a flat wooden spoon and continue to monitor it as it thickens. When the cornmeal begins to make popping sounds, make a space in the middle and pour in about a ½ cup of water and stir. Continue this process of making a space in the middle until the cornmeal is cooked (about three to four times). 4. Make a space in the middle of the cornmeal and add the okra. Mix in the okra well. 5. In large bowl, add about ¼ cup of oil, and turn the bowl so that its sides and the bottom are coated with the oil. Scoop desired amount of the cornmeal okra mixture into the bowl. Using the bowl, turn the bowl to shape the cornmeal into a round ball. Serve immediately with the codfish and chop up. Terri writes the blog Try Anything Once, which chronicles her local, national, and international food and travel adventures and everything in between. She can usually be found tweaking her list of restaurants to try, watching DVR’ed episodes of Top Chef, dreaming about her next trip, and tweeting way too much. This looks so good! And I totally agree with your sentiments on community cooking. This last week I’ve been cooking with friends and family of friends and it has been the best! Great conversations, great people and great food makes for a perfect day every single time! This entry was posted on December 27, 2011 by Lisa Johnson in 2011, Personal Story, Recipe, Ujima and tagged Antigua, Fungee Cod Fish & Chop Up, Kwanzaa, recipes, Try Anything Once, Ujima.